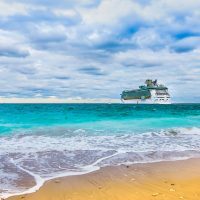 Carnival Corporation’s Fathom cruise line is generating a lot of buzz as it sailed its first cruise ship from Miami to Cuba in May 2016. Breaking down the travel barriers between America and Cuba, This isn’t your standard cruise, however. Instead, this sailing is what Carnival is calling “impact” cruising, where passengers will be required to give back to the community in a variety of programs offered at port. This also isn’t a traditional Carnival “Fun Cruise,” with a towering ship filled with water slides and games. Instead, the ship used to sail this particular sailing is the Adonia, formerly a ship used for adults’ only sailings. For a cruise touting a family aspect, it’s surprising how little of the ship is dedicated to kids. No meet-and-greets are offered, no kids’ clubs, no family programing at night, no children’s menus in the restaurants. However, the ship is small enough that kids will find each other and end up playing hide and seek and games of tag as they run around the ship during at-sea days. And, what the ship lacks in size, it makes up for in beauty. The rich woods and crown molding throughout the ship make for an elegant appearance, but the cozy couches and high back chairs keep it comfortable and not too stuffy. Kids can feel comfortable in the elegant-looking library playing a board game while parents will enjoy knowing their kids are never too far away, even when off exploring the ship. The pool and hot tubs on the Lido Deck are also small, but bring plenty of fun and relaxation. And the food at each of the restaurants features fresh and authentic Dominican and Cuban cuisine that everyone will love. The Adonia travels to both the Dominican Republic and Cuba. While in each country, travelers can participate in what Fathom calls Social Impact or Immersion Activities, where travelers can engage with the culture and the people of each country while also helping them enrich their businesses or culture. While children under 8 years old are not permitted to travel on the Adonia, tweens and teens will appreciate the social impact opportunities while cruising with Fathom. The added bonus of shore excursions and a huge pool and waterslides at Amber Cove, the Dominican Republic port, or touring several destinations in Cuba, make the cruise fun and memorable. Related: What to Expect on Fathom’s Social Impact Cruise to the Dominican Republic. Unfortunately, with the ship’s focus of social impact activities, there isn’t much for the kids on board. Carnival took a ship that formerly was adults only and transformed it into a family space. There isn’t a dedicated kids’ club, the pool is small, and beyond a few gatherings, kids will have to make their own fun on days at sea. The main outdoor pool, situated on the Lido Deck, is small but ideal for kids. It features a ledge that allows for splashing and then a deeper section in the center. Elevated above the pool are two hot tubs that adults and kids can enjoy. Surrounding the pool are numerous lounge chairs both in the sun and under an overhang that provides some shade. Four cool “hanging” swing chairs are fun to relax in too and are on high demand. They are situated under the overhang at the far four corners of the pool deck. It’s not difficult to snag a lounge chair while at sea but if you prefer to be slightly more secluded there are even more lounge chairs set up on a faux grassy deck area just above the pool deck. Two Ping-Pong tables can also be found next to the pool. Overlooking the pool area is the elegant-looking, but comfortable library. There are numerous books from all genres sitting in dark wooden bookcases, available to borrow. Guests can read, nap or just relax in the comfortable couches or high back chairs, which are situated around a faux fireplace and tables. Computers for guest use can also be found here, along with the ability to find “good” Wi-Fi on your personal devices. Kids will love the bookshelves filled with numerous board games, puzzles and card games, great for a family game or to play with new friends. There are more than a few duplicates for each board game so kids will always have an opportunity to play whatever they would like. Some of the board games include Sorry, Jenga, Apples to Apples, Scrabble, Yahtzee, Taboo, Risk and chess. Activities, seminars and live music fill the days at sea on the Adonia. The seminars, which travelers are encouraged to attend, vary on different days and times. Parents and children may enjoy learning Spanish phrases in anticipation of impact activities. Learning what it means to be a “Fathom Traveler” will bring the group together and allow kids to understand the meaning behind the social impact vacation. The purpose of the seminars is to prepare you for your Dominican Republic adventures and allow you to discover who you are as a person. The “Story of You” has travelers telling the group “their” story or about a time when something significant changed in their life. “Lifehack Bootcamp” offers tips and tricks on how to better organize yourself and your family. Participation in the seminars is not mandatory, but don’t expect to sit back and listen once you’ve arrived at a seminar. If the kids (or adults) aren’t up for a seminar, try the scavenger hunt around the ship, which will be fun and assist in learning to navigate the ship. Movies are shown several nights on the ship. Guests will find the nightly movie (a semi-new release or classic like “Casablanca”) listed in the Soundings Newsletter, along with the movie’s location. While the movie choice may not be geared directly towards kids the options are usually family friendly and in the PG13 range. Guests can cozy up in the Card Room to watch the movie or the movie may be shown outside on the deck under the stars. The Adonia cruises to one destination in the Dominican Republic, Amber Cove, and it also sails to Cuba. 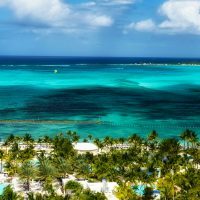 The Carnival Corporation (the parent corporation of Fathom) invested more than $85-million to create the Puerto Plata Dominican Republic port, and it shows. This is where the kids will have fun. Guests will find a huge pool area with countless lounge chairs, all included in the cruise rate. Pool noodles are available at no cost and lifeguards surround the pool. There are zero-entry points and depths going up to about 3 feet. Kids will love the splash pad with a small slide and two larger waterslides. There’s an $8 charge for an umbrella and there are no shaded areas to be found without an umbrella. Guests can also purchase unlimited runs on the small zip-line and hourly use of kayaks, pedal boats, or paddleboards. Several shops, a coffee shop which serves regionally grown coffee and a large indoor/outdoor restaurant and bar are also located in Amber Cove. Coco Cana serve a variety of specialty dishes of the North Coast of the Dominican Republic (sandwiches, salads and burgers) along with cocktails. Guests are welcome to dine (or drink) inside Coco Cana or poolside and can order from poolside servers. The 360-Degree Bar, a hilltop bar, offers cocktails and amazing views. Food and drink at Amber Cove is extra and cash or credit cards are needed. Guests can not charge to the ship stateroom. Guests can also rent one of the large pool cabanas and book it while onboard the ship. There are four types of cabanas each with a different rental fee. The Ocean Cabanas, for six guests, have a rate of $275. The Poolside Cabanas, for six guests, have a rate of $250. The Hillside Cabanas, for six guests, have a rate of $250. And the Grand Cabana on the Water, which can fit 20 guests, has a rate of $1,170 and there is only one Grand Cabana available. The cabana is yours from the time you rent it until the ship departures. The furnished cabanas include, an outdoor misting system, air condition, TV with HDMI and Wi-Fi, refreshments and a snack basket. Lounge chairs, floats and outdoor showers plus waiter service are also available. Zipline tickets are included for each person in the cabana too. Guests of the Grand Cabana, which features a Jacuzzi, also receive two snack baskets, two water sports elements for one hour and four umbrellas around the pool area. Once the ship arrives in Amber Cove, travelers are encouraged — but not required — to participate in Social Impact Activities. There are eight activities to choose from – Reforestation, Recycled Paper, Cacao Women’s Chocolate Cooperative, Community English, Student English, Water Filters, Concrete Floors and Creative Arts, Music and Sports (in the summer months). A group of about 25 or 50 people (depending on the activity) will head to each activity at specified times and will be joined by Impact Guides who are there to answer any questions, translate and assist in the activity. Each Impact Activity takes place in a different Puerto Plata community. Travelers may be in a small community, or high up in the mountains or at the beach. It all depends on which activity you choose. During the Impact Activities, travelers work alongside the Dominican Republic people who show the travelers the step-by-step instructions on how to perform the task. Reforestation involves planting trees. In Recycled Paper travelers create sheets of paper from paper bits. Cacao Women’s Chocolate Cooperative allows you to create chocolate in molds and wrap chocolate bars. In Community English and Student English travelers visit a Dominican Republic home or school and teach the adults or children simple English phrases. No Spanish language knowledge is required and an instructional book is provided. During Water Filters, travelers use clay to construct a filter that is used to purify water (there’s also time to “play” with some of the clay). Many of the houses in the Dominican Republic are situated on dirt floors, so in Concrete Floors travelers help to pour cement floors in homes. And in the summer months, when school is not in session, travelers can participate in Creative Arts, Music and Sports which is another way to teach children the English language while playing sports and singing songs. Families can choose ahead of time to do any of these activities in the morning or afternoon (each activity lasts several hours) and a local lunch made by the Dominican Republic people is provided during the activity. Lunches varied from activity but mostly consisted of chicken, salads and vegetables and were prepared locally and enjoyed in a park or common area near where your activity was taking place. Plenty of bottled water was also provided. All of the Impact Activities are included in the cruise rate. There is no additional fee to participate and shuttle buses are provided to each activity. Read more about the Carnival Fathom Social Impact Activities here. Shore excursions like power snorkeling, deep sea fishing, beach or island tours, zip- lining through the countryside or touring Fort San Felipe are among the activities available for added fees. The shore excursions took about a half day or several hours in the morning or afternoon depending which one you chose. Lunch is not provided on a shore excursion unless that is designated for your specific trip. However, Fathom does provide shuttle transportation to and from the shore excursion. The Adonia has 352 staterooms and carries about 700 travelers. Each cabin is equipped with a television, desk, hairdryer, safe (not a laptop safe), a tea and coffeemaker, and a mini-fridge. There is a large closet with hangers and space for putting luggage away. There are three drawers inside a floor-to-ceiling type cabinet that also offers a shelf for miscellaneous items. Then under the television are more drawers along with a few drawers in the nightstand as well. A large mirror can also be found in the staterooms. The stateroom decor is modern elegant with hints of blues, greens and browns in the wood. The beds can be configured as two twin beds or a queen. The large suites feature a separate lounge area with a sofa, chairs and a table, and a mini-fridge. Sliding doors open to the spacious balcony, where a small table and chairs can be found. The bathroom also features a whirlpool tub. The suites would be most suitable for a family of four or larger. The balcony staterooms feature twin or double beds, plus a sleeper sofa. There is a mini-fridge, and floor-to-ceiling sliding glass doors lead to the balcony, where two chairs and a small table sit. The bathroom features a stand-up shower, blowdryer and storage for toiletries. Two adults and a child could fit comfortably in a balcony stateroom. Outside cabins feature a window or porthole and a sleeper sofa. The bathroom features a stand-up shower. Inside cabins do not have a window or porthole, but do feature a sofa. The bathroom has a stand-up shower. No specific kids’ menus are available at any of the restaurants, but there are a variety of items that children enjoy, especially at the Conservatory buffet. This buffet restaurant is open nearly around the clock. Breakfast, from 6:30 to 11:30 a.m., includes an omelet station, fruit, eggs, pastries and breakfast meats. Lunch, from noon until 3 p.m., includes salads, sandwiches, French fries and a variety of rotating items each day. Afternoon snacks can be found from 3 to 5:30 p.m. and dinner, from 6 to 9 p.m., often consists of similar menu items found at Pacific Restaurant, like fish, chicken or beef, plus great desserts. If you’re still hungry, late-night snacks are served from 9:30 p.m. until midnight. Serving breakfast (8 to 9:30 a.m.), lunch (noon to 1:30 p.m.) and dinner (6 to 9:30 p.m.), this business or resort casual restaurant features delicious dinner menu items like Cuban chicken, duck, lamb and pork. The desserts at Pacific are both beautiful and delicious. No reservations are required and no pre-designated dining time is needed either. The coffee bar situated at the entrance to Pacific Restaurant is a must for any dedicated coffee drinkers. Featuring authentic Dominican Republic and Cuban coffee, parents will love their caffeine fix while sitting in the lounge area; you can also take the coffee to-go. For an additional cost ($25 per person), the Ocean Grill is open for lunch and dinner and reservations are required. International Renowned Chef Emil Vega has created a superior menu of Dominican and Cuban cuisine. Some of the Ocean Grill menu items include lobster tail, shrimp, beef and pork. The desserts here are impeccable, so save room! While at sea, a BBQ is available outside by the pool area from noon to 2 p.m. on select days. Guests will find salads, hot dogs, sandwiches and desserts at the BBQ. Dress is casual. While people may dress more nicely for dinner in the restaurants, formal dress is never required. There is no formal dinner night. However, bathing suits are not permitted at the restaurants. The ship’s decor may give the impression of a more formal dress code, but Fathom promotes a casual feel and dress. For the Social Impact Activities, dress is even more casual. Pack T-shirts, shorts, jeans, long pants, long skirts or clothes you don’t mind getting a little dirty or sweaty. Sneakers or comfort shoes and flip flops are good and heels are not needed at all. It’s also requested that if you plan to work with the children on your Impact Activities, knees and shoulders should be covered and no tight clothing is permitted. Sunblock and bug spray are also a must. A backpack is also a good idea. While at sea, the Wi-Fi is very spotty and does not work exceptionally well. Guests must purchase Wi-Fi minutes and can pay per minute usage or purchase a minute’s package ($62 for 250 minutes). Once in port, Wi-Fi is free and while it is slightly better quality, the Wi-Fi works best when off the ship and in Amber Cove, where it is also complimentary. For an additional $8 per day, Wi-Fi access can be upgraded in Amber Cove, as well. The daily newsletter arrives at your stateroom each evening and informs guests of their activity’s call time the next day. Note: The call times for morning Impact Activities start early, around 7:15 a.m. each day. The Soundings also lists the seminars for the day, live bands, movie times and other helpful information. A small jogging track overlooks the pool area on the Lido Deck; about 14 laps around the track equals one mile. The large fitness center offers cardio and weight machines, as well as an area for yoga and fitness classes. The fitness center is open from 6 a.m. to 10 p.m. Located in the Atrium, the retail shops offer guests everything from sundries and snacks to jewelry and clothing. Smoking is permitted in two designated areas. Peak season for the Adonia is June through early August when prices are at their highest. Shoulder season, April through May and late August, offer a slight decrease in rates and low season in September offers a discounted rate. The Adonia cruises out of the Port of Miami. Transportation from the airport to the Port of Miami is not included. However, Fathom does provide all transportation to the Social Impact Activities, but guests must secure a taxi or rental car to get to shore excursions or explore the island on their own. Getting around the ship is simple as it is a smaller ship. There are signs at every elevator to assist with direction and after a day or two of familiarizing with the ship, it’s easy to find your way. Taxis are readily available in Amber Cove along with a listed price rate for different island destinations or excursions. A rental car agency is also available at Amber Cove. Open from 8 a.m. to 10 p.m., the spa offers massages, manicures and pedicures and other treatments for additional costs. After a long day of giving back, parents may welcome some pampering. For an additional fee, a large hot tub can be found on the deck off the gym and spa area. It’s a secluded spot and for someone looking for complete peace and quiet, it’s ideal. Parents can enjoy an evening cocktail, beer or glass of wine at the Crow’s Nest, Curzon Lounge, Anderson’s and the wine bar, The Glass House. Live music is featured at different times at each of these onboard establishments.